A salad can be a delicious intro to a meal, a light accompaniment to a rich dish, or it can be a meal all on its own. You can throw just about anything into a salad, drizzle with your favorite dressing and you're good to go. This doesn't mean you have to go crazy, though, like you're at a salad bar with a million different salad components. Sometimes the best salads are the simplest! This specific combination of ingredients is so simple, it's barely a recipe. But you won't believe how tasty they are together. Your guests will be raving about your dinner, even before they get to the main course! Remove the core end of the Romaine hearts, then slice the lettuce "cross-ways" into 1 inch strips. Separate the leaves and place them in a large salad bowl. Top with orange slices. Place pecans, butter, sugar, and salt in a small skillet. Gently heat over medium heat and stir until the sugar is dissolved and the pecans are well coated and slightly toasted. Spread pecans into a single layer on a baking tray or piece of parchment paper. 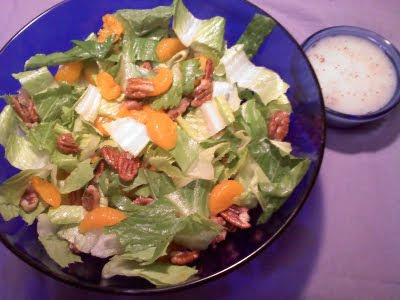 Once cooled, toss the pecans with the lettuce and the orange slices. Serve with your favorite brand of poppy seed dressing. You don't even have to candy the pecans. They'd be delicious just as they are, but I'd still recommend toasting them for a minute or two in a dry skillet. For a refreshing variation, try substituting fresh sliced peaches for the Mandarin oranges. The sweet and sour flavor of the dressing is SO good on peaches! I usually don't mention specific brands, but I must say, I'm particularly fond of Brianna's Rich Poppy Seed Dressing. Yummy!! I think I might have to make this salad this week.